Way back in 2006, the John Templeton Foundation published the results of its study on prayer and its effect on people who were suffering from major heart conditions and undergoing heart surgery. The study was double-blind and used a control group. Two groups were chosen, one of which were prayed for and the other which was not, but neither were told which group they were in. A third group served as a control were prayed for and told this. More people (59%) in the control group suffered more complications than in the groups who did not know if they were being prayed for (51%). 18% of those in the uninformed prayer group suffered major complications (including heart attack) as compared to 13% in the group that did not receive prayers. These results have precedent: the New York Times reports on a study done in 1997 studied 40 alcoholics in recovery. Those who were prayed for did worse than those who were not. 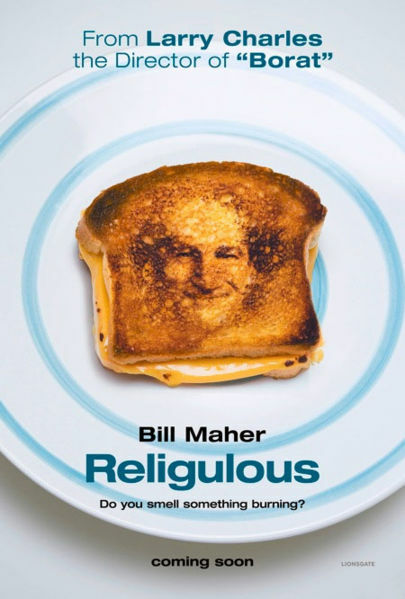 In this new comedy… comedian and TV host Bill Maher takes a pilgrimage across the globe on a mind-opening journey into the ultimate taboo: questioning religion. Meeting the high and low from different religions, Maher simply asks questions, like “Why is faith good?” “Why doesn’t an all-powerful God speak to us directly?” and “How can otherwise rational people believe in a talking snake?” For anyone who’s even a little spiritually curious, this divine entertainment will deepen your faith…in comedy! Let’s just say that even from the jacket, it is obvious that there are quite a disparity of opinions being expressed in this “documentary” that comes in the spirit of a Michael Moore film. Bill Maher has quite the abrasive personality that is also darkly engaging. This seems to be at least at some level a personal journey for him. The film starts with a conversation with his mother and is salted with his own experiences in being 50% Catholic and 50% Christian.